Travelling by train is easy with the PKP train connection between the airport and the city centre. Personally I had never been a train goer. I always wanted to have my freedom going by car in Tricity. Soon, I discovered the easiness of public transport and started to take the train effectively. Coming from the Lech Wałęsa Airport, you can immediately take the train to Old Town, the city centre of Gdańsk via Wrzeszcz. Upon arrival coming out of the arrivals gate, you follow the red line leading you to the train station. Well indicated signs take you to the platform. These platforms were built in 2014, part of the modernization of the Rapid Urban Railway railway track (SKM). The other side brings you to Gdynia. SKM-trains recognizable to the blue and yellow colours, bring you within Tricity only. Browsing online: what website to choose? This depends about where you want to travel. Basically both SKM and PKM trains can bring you at your destinations. Below I will be discussing some options. Time schedule on the Szybka Kolej Miejska of Tricity (SKM) or the Fast Urban Railway: the official website, even though the entire website seems to be at this time still in Polish, the passenger center area where you can look up the train schedule is in English. Maybe the overview of the train map for tricity on the communication section of the trojmiasto.pl website can help you out finding the route you need to take. 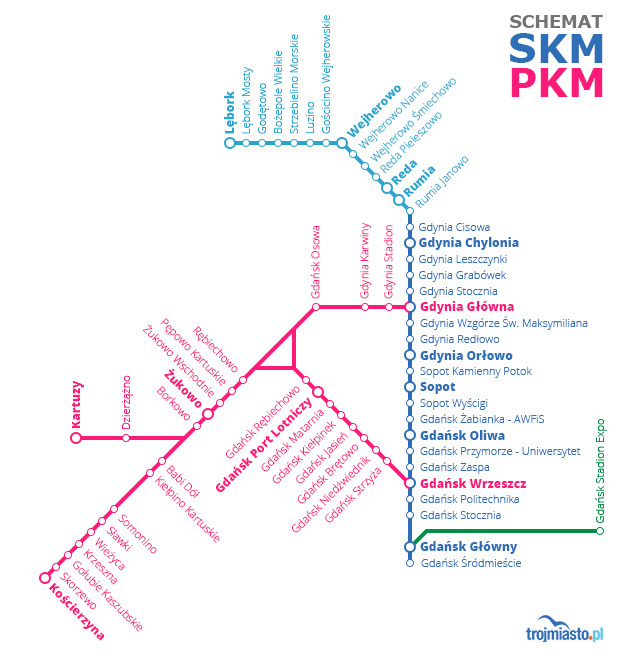 SKM-trains are only for tricity, trains are usually blue and yellow and connect Gdańsk, Sopot and Gdynia fastest. It is the Rapid Urban Railway. PKM-trains (Pomorska Kolej Metropolitalna, the Metropolitan Train from the Pomorska province, also operated by the SKM-company) bring you from/to the airport and operate outside of tricity. The PKM-network connects Gdańsk Główny (Gdansk Main station) and Gdańsk Wrzeszcz to the Lech Wałęsa Airport (25-40 mins) and Gdańsk western suburbs, and further to Gdynia, Kartuzy and Kościerzyna (from ‘Wikitravel Gdańsk’). – Browsing the time schedule on the Rozklad-pkp.pl website is easy and user-friendly. – Browsing the PKP Intercity time schedule offers an easy to use journey planner. You can of course also travel within tricity but these trains go further than the tricity boundaries. Different hours apply than the SKM-PKM trains as Intercity trains have different schedules. You can buy season tickets, handy if you stay for a weekend or longer. Browsing the Polregio website looking for a time schedule is at this stage rather user-unfriendly. The website redirects you to another one where you need to register (free takes up to 3-4 minutes). I have not tried this option yet. I am using apps that allow me to travel without the hussle of having to search for routes. With this app you can search for connections using the SKM trains only. Download the app from the Apple iTunes / Android Google Play / Windows store. The app is available in 3 languages (Polish, English, German) via the menu icon > Settings (last item) > Language selection (last item). The app offers information about all railway providers in Poland and beyond the border. It shows the timetable of Polish State Railways PKP. Download the app from the Android Google Play / Apple iTunes / Windows store. With the GPS option you can see the route you are taking while travelling. This app allows you after connecting your bank account with the application, to make valid payments for the transport by bus and train, car parking and cinemas. For the time being the app is in Polish only, not sure whether it works with a foreign bank account either. I have asked the Skycash team about their plans to offer the app in English. there’s an offline mode: even if you lose internet connection you are able to retrieve the e-ticket (saved in the app). the e-ticket is also limited in time i.e from a specific point to a a specific point in time, not beyond that. In other words, the e-ticket is very handy when the train is in time and you do not have any internet connection issues. However, when the train gets delayed or when you lose your internet connection, you lose the e-ticket and will need to buy another one. Not an issue if you think of the price, barely 1 euro/dollar. It still is the cheapest way to travel in Tricity. 1. How much does a train ticket cost? Wherever you buy the ticket, for the price of 3,50 PLN (less than a euro and dollar, to calculate quickly: 1 EUR/1 USD = 4 PLN), you can travel all over Gdańsk territory but do not cross the city boundaries. For this price you can go from the airport to Wrzeszcz (check out the location on openstreetmap), after which you will have to either change from train wagon or from train, leading you to Gdańsk Głowny (Gdańsk Main Station on openstreetmap). 2. Where can you buy the train ticket? Nowadays you can buy it online (see above). If you want to have a ticket in paper form, you buy it either from a kiosk or at the ticket vending machine on the modernized railway tracks finished in 2014. You need to validate your ticket prior to boarding. If you need to, you can also buy the ticket on board from the train conductor (usually in the first train wagon). They do not always talk English. So you can try to order it in Polish: Poe-Prussia Bee-let Normal-na Dough (and then the city name… e.g. Gdańsk) (from ‘local life SKM Rapid Urban Railway’). In any case, make sure you can show the conductor the name of your destination in writing as the pronunciation in Polish often causes confusion (from Wikitravel Gdańsk and from my own personal experience as well).